Our Hazel Sue is here and we are over the moon in love! 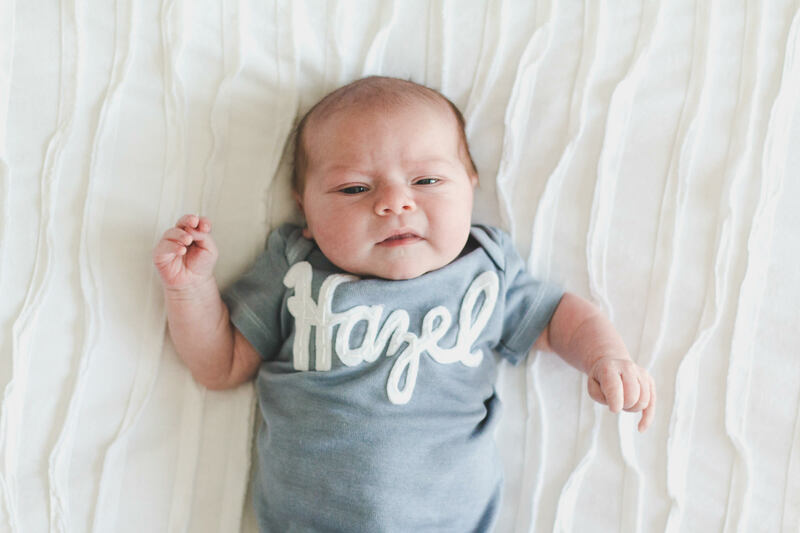 In true millenial form, I will write her birth story sometime in the future but I thought I’d write about why we chose the name Hazel since a few people have asked. Ryan and I had talked about baby names far before we ever got pregnant. We didn’t discuss it at length but we did know the names we both agreed on. It wasn’t until we knew we were having a girl that the name Hazel came up. I am big on choosing a name that has meaning, especially if it has Biblical meaning. At first I liked the name Hazel by itself, it’s unique yet classic. Most name books just say that Hazel refers to the tree and is English but after a little digging, I found an alternative that I fell in love with and became part of the reason why we named her Hazel. The name Hazel is a derivative of the Hebrew word hazā’ēl meaning “God sees”. There are only a few places where this phrase is used in the Bible and one of them is in the story of Abraham, Sarah, and Hagar. During the two and a half years we struggled to get pregnant, I found a lot of inspiration from the stories of barren women in the Bible. I always connected with Sarah because of her struggle to have a child but someone shared some insight on Hagar that really resonated with me and made me fall even more in love with the name Hazel. Hagar found out she was pregnant and because of Sarah’s mistreatment, she fled away towards her homeland. This was a dangerous thing for a woman to do. She could have been taken captive and being pregnant, she could have lost her baby from the rigors of traveling. Plus, having escaped probably in the night, she would have had few supplies. She somehow made it to a spring of water in the desert and sat down exhausted. Hagar knew about Abraham’s God and must have wondered if He knew or cared about her and her situation. She probably felt abandoned by everyone. But God seeks her out, finds her, and talks to her. He gives her instructions — to go back to her mistress — and gives her promises for her son, who will become Ishmael. After she had her son and when she was forced to leave, she again wandered in the wilderness. When all their water was gone, she placed Ishmael under a bush and pled with God to not have to watch her son die. When she was at her lowest point of despair and misery, He shows her a well and again gives amazing promises to her son and her posterity. After her encounter, Hagar calls Him El Roi — Thou God seest me. God has demonstrated to me that He sees me in so many ways. I love in Genesis 16:11 where it says, “because the Lord hath heard thy affliction”. Not her prayer, but God heard her affliction. When we were in year two of fertility treatments, I stopped praying for a child. It was always in my heart but I thought, why keep praying for it? But God heard my affliction and responded in such personal and meaningful ways. Even through my miscarriage, I felt seen by Him. And in giving us this daughter, He has shown us He had amazing promises to give. The story of Hagar is so encouraging for those who are suffering and feel God has abandoned them. He has not forgotten you, He sees you. ​Her middle name Sue is not only my middle name but also my mother’s and I can’t think of a better example of someone who makes people feel seen and loved than my mom. We are so grateful for our little Hazel Sue and I hope we can raise her to help others feel God’s love for them too!